Colombia's Paulina Vega was crowned Miss Universe Sunday, beating out contenders from the United States, Ukraine, Jamaica and The Netherlands at the world's top beauty pageant in Florida. The 22-year-old model and business student triumphed over 87 other women from around the world, and is only the second beauty queen from Colombia to take home the prize. Vega, wearing a long silver sequined gown, was beaming and tearful as she accepted her sash and crown from reigning Miss Universe, Venezuelan Gabriela Isler. Paulina Vega was born on January 15, 1993 in Barranquilla, Colombia. She is the daughter of cardiologist Rodolfo Vega Llamas and Laura Dieppa, and granddaughter of the legendary tenor Gatsón Vega. She studies business administration at the Universidad Javeriana in Bogota. She has been a model since she was 8 years old. Paulina belongs to a big family, four sisters and three brothers. She graduated from a German school in Colombia, and speaks English and a bit of French. In the Miss Universe Colombia pageant she earned the highest score possible in every presentation, 9.9. During her spare time, she enjoys being with her family and friends, and going to the park with her dog Mateo. The crowd doesn't seem to be happy with Miss Jamaica being 4th runner-up. Miss Jamaica was the top trend on Twitter towards the end of the competition, so viewers were shocked with the announcement. The new Miss Universe will be crowned in a few minutes. Who will it be? A special tribute to Miss Universe 2013 Gabriela Isler for 60 secs showing what all she did in the year after winning the crown. A flashback showing former Miss Universe from past several years. The final round of the competition was divided into two parts: First, the top five candidates from USA, Netherlands, Colombia, Jamaica, and Ukraine answered questions given by the judges. On the second part of the 'question-and-answer' round, all five candidates answered one question posted by a netizen on the Miss Universe official Facebook page. "What is the greatest contribution of your country to the entire world?" Miss USA Nia Sanchez said that her country always 'gives back' to other nations. Miss Netherlands cited her country's art and history as the contributions of Netherlands to the world. Miss Ukraine narrated the current situation in her home nation recovering from war. Fennell cited legends Usain Bolt and Bob Marley as their country's contribution. Lastly, Miss Colombia Paulina Vega said that the perseverance of the Colombian people amid problems is the offering of her country to the world. Gavin DeGraw is performing at the Miss Universe competition. DeGraw sings 'Fire' and from his new album 'Finest Hour: Gavin DeGraw' during the competition's final look. Question for Colombia: What could women learn from men? Colombia: (her answer was unclear) I do believe in equality – and I believe that is what women should learn from men. We continue fighting for what we want to accomplish. Emilio Estefan's question for Jamaica: 1 of 3 women will experience violence in her lifetime. What can be done to get that number down? Jamaica: We as people of the world should work together to prevent it now. Question for Ukraine: If you could remove the swimsuit pageant for Miss Universe competition, would you? Ukraine: It depends on the situation. Why not, if you feel comfortable. Giancarlo Stanton's question for Netherlands: What's the biggest change you'd like to see for young women in the next generation? Netherlands: I'm an ambassador for child prostitution. I want it to stop, so that's what I want for the next generation. 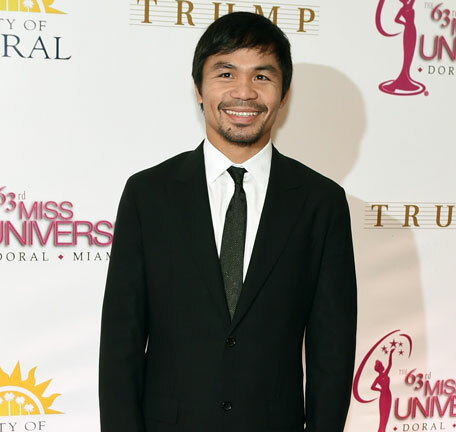 Manny Pacquiao to Miss USA: If you were given 30 seconds to deliver a message to a global terrorist, what would you say? USA: I would give a message of hope, love, and peace. The Top five finalist have been announced. Miss Indonesia takes home the Best National Costume. Indonesia was announced winner through Twitter fan votes. Miss National Costume Universe: Miss Indonesia Elvira Devinamira. 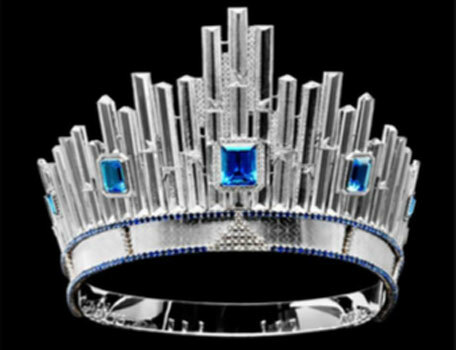 This year's Miss Universe will wear a new crown, which is inspired by the New York City skyline. It's worth over $300,000. The crowd went wild as Miss Jamaica Kaci Fennel and Miss Philippines Mary Jean Lastimosa took the stage in their evening gown. Miss Philippines Mary Jean Lastimosa is keeping the hopes of millions of supporter alive to win the Miss Universe crown since 1973. Miss India Noyonita Lodh does not feature in the Top 10 list. Pop singer Nick Jonas perfoms on stage amid Miss Universe contestants. Prince Royce performs onstage during The 63rd Annual Miss Universe Pageant at Florida International University on January 25, 2015 in Miami, Florida. The Top 15 Semi-finalists are back on stage and struts confidently in swimsuit. Miss Universe 2014 swimwear is featured by Yamamay. Top 15 Semi-finalists announced; India's Noyonita Lodh, Miss Philippines makes it to the list. 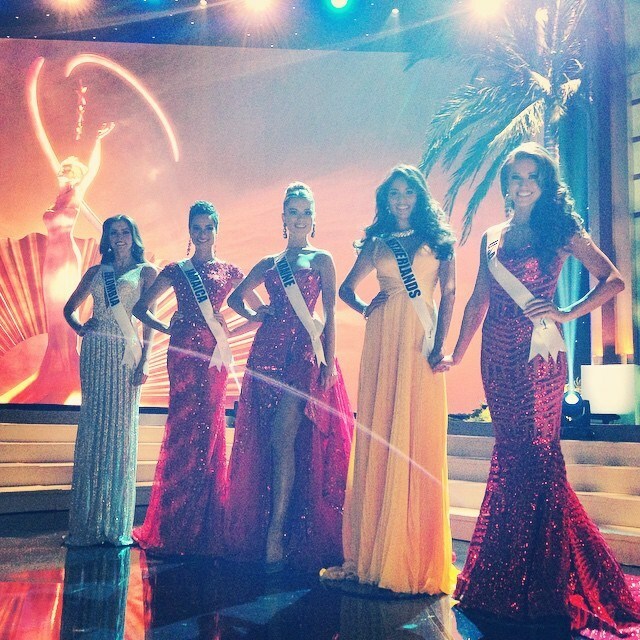 Miss Universe 2014 pageant begins. The annual Miss Universe pageant begins as hosts Thomas Roberts and Nathalie Morales introduces the 88 hopefuls parading their national costume. All 88 beautiful contestants take on the stage for the last time. Former beauty queens, hosts and the judges arrive at the venue. The beauty pageant plays out Sunday in the city of Doral starting at 8 pm (0000 GMT Monday) at a sports facility at Florida International University. A successor will be chosen to Miss Universe 2013, Gabriela Isler of Venezuela. The world's lovelies staged a preliminary competition on Wednesday, parading first in casual wear, then formal night wear and finally in pink bikinis. People in the crowd waved national flags and clapped for their favorites. That first battle weeded the field down to 15 finalists. But the names of those 15 chosen by a jury will be kept secret until Sunday. The winner will actually be crowned Miss Universe 2014 since the pageant was supposed to be held last year but was postpone until now. A 2015 pageant is to be held later in the year. 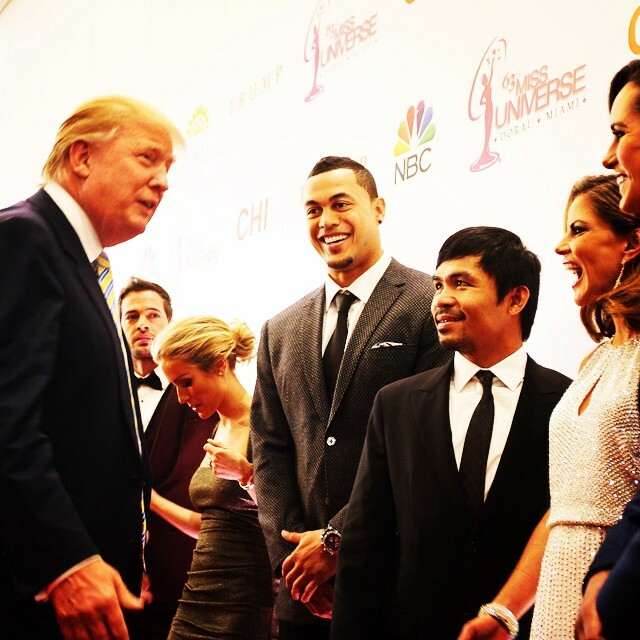 The winner will be chosen by a jury of five people, including Cuban actor William Levy, Philippine boxer Manny Pacquiao and two stars from US reality TV shows, Kristin Cavallari and Lisa Vanderpump. 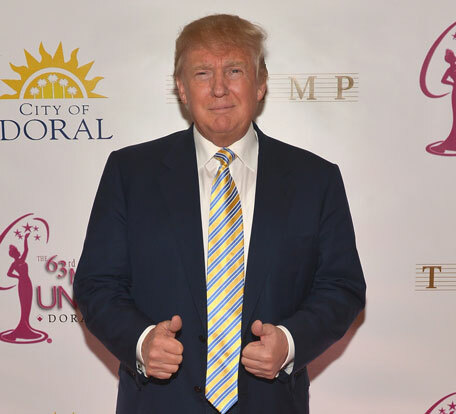 The contestants have endured a grueling process of preparation and activities around Doral and Miami, followed by a gaggle of journalists and fans. "They say it is a beauty pageant, but the truth is that it is a beauty pageant of endurance, because it is not easy to be here. It is not easy to go on until four or five in the morning every" day and "wake up, look good, radiant and smile no matter how tired you are," said Miss Mexico, 24-year-old Josselyn Garciglia.